Review and information about HUAWEI P20 LITE. This is Android smartphone which have dual camera main camera at back side of body and single front camera for selfie photography. HUAWEI P20 LITE comes with Android Oreo version 8.0 as factory default operating system. It have fingerprint sensor and some other important features. Please note, we are not saying that HUAWEI P20 LITE are totally bad, but we will give more information from our point of view. If you have more information, please use comment box bellow to share with others. 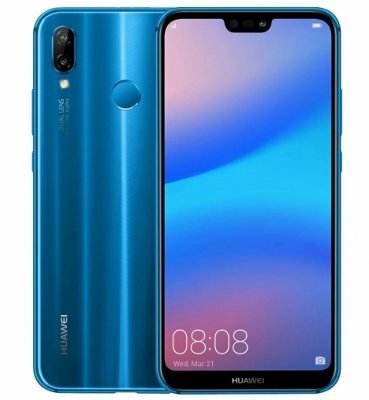 This phone release at several country with different specifications at memory and front camera, some type have name as HUAWEI NOVA 3E and also HUAWEI P20 LITE 24 MP. This phone have 5.84 inches LCD screen with LTPS IPS LCD screen type. Its already use latest ratio at 19:9 aspect ratio to make body become slim or not too big. At front body, we will find wide full screen LCD with Notch above the screen, it is use to keep front selfie camera, light sensor and speaker. Disadvantages of Front camera does not have LED light flash. At right side of body, we can find volume button and power button together at same side. At left side, we do not find any button, only card slot available at this side. At back side of body, we can find dual camera which located at left top corner vertically. The fingerprint located in the middle bellow camera, make it more easy to hold with finger. Huawei have their own processor manufacture. HUAWEI P20 LITE as mid end smartphone use Huawei own processor HiSilicon Kirin 659. This is 64 bit processor with 16 nm fabrication. This processor have dedicated GPU graphic processor unit Mali-T830 MP2. At HUAWEI P20 LITE, this processor run with Octa-core 4 x 2.36 GHz Cortex-A53 & 4 x 1.7 GHz Cortex-A53 to make this phone run without problems for most applications and 3D game HD. We can choose to have 32 GB or 64 GB internal memory, but at some country, HUAWEI P20 LITE also have 128 GB internal memory, all type have same 4 GB RAM for multitasking applications. Drawbacks of HUAWEI P20 LITE does not have dedicated external memory slot, but we still can add external MicroSD using slot 2 network card. That is why, when we want to use external memory, we only can use single Sim Network Provider. HUAWEI P20 LITE have 3000 mAh battery, almost same with other product with LCD width range. More bigger LCD ideally have more bigger battery because one of the most battery drain are LCD and network data. This phone have quick charge features when recharge at USB-C type slot. Fast charging work almost half of battery capacity when charge from empty state, for about 30 minutes. We can use fingerprint easily because it is located at back side of body. Please do not forget to register our fingerprint to make it work for security protections. This phone also have good accurate front camera for alternative security protections known as Face Unlock. There are also other options like password, pin and screen lock pattern. HUAWEI P20 LITE already have dual camera with 16 megapixel and 2 megapixel. Actually the main camera which is take good pictures available at 16 megapixel, but demerits of this camera only have aperture number f/2.2, therefore we will not get very bright pictures / photos when taking pictures at low light situations. The second camera 2 megapixel use for deep of field (DOF) effect like DSLR camera. We can focus at main object and the background will be blur with both combination camera. Some type of HUAWEI P20 LITE use front camera with 16 megapixel together with aperture number f/2.0. The other type of HUAWEI P20 LITE use 24 megapixel with same aperture number f/2.0, this phone also known as HUAWEI P20 LITE 24 MP. Is HUAWEI P20 LITE / NOVA 3E Worth To Buy ? HUAWEI P20 LITE is mid-end smartphone which work with HiSilicon Kirin 659 Huawei own processor manufacture. Some applications can run without problems at this phone, but do not expect to fast when working with HUAWEI P20 LITE because the processor have limited performance when work together with multitasking applications. However, this phone is worth to buy because it have good design, dual camera with DOF, full screen with notch LCD and have big internal memory start from 32 GB until 128 GB for selected type. This article is talking about drawbacks of huawei p20 lite, honor p20 lite disadvantages. You can find other topic at our related post bellow.